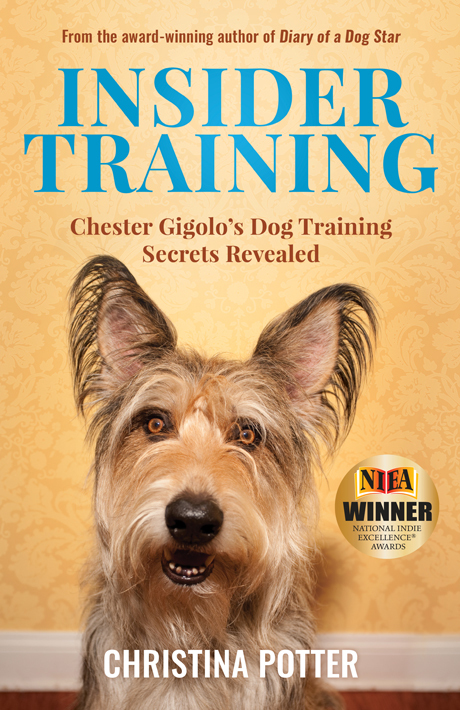 Canine star Chester Gigolo’s dog training secrets revealed. If you want a better life for you and your dog, this is the book you’ve been waiting for. You can successfully train your dog! In Insider Training, Christina Potter presents easy step-by-step instructions, humorously told through a dog’s perspective, to successfully train your canine companion. Whether you’re training for the home, the show ring, or the big screen, all breeds large and small will respond to the exercises, sound advice, and insightful tips contained in this book. Written by a professional dog trainer whose dogs have appeared in movies, on television, and on magazine covers, Insider Training will teach you and your dog, through positive reinforcement, how to become partners and enjoy your life together to the fullest. Photo by Taylor “Sherm” Potter, courtesy of ShermanArts Photography. Christina Potter has been training dogs for over twenty years. She has trained various breeds such as Golden Retrievers, Chinese Cresteds, Berger Picards, and an Afghan Hound. She has spent thousands of hours working with dogs on print ads, websites, motion capture for video games, commercials, and television shows–both live and pre-recorded. She was the main trainer on such feature films as Funny Games, As Good As Dead, and Our Idiot Brother. She has also trained dogs to compete in Rally, Competitive Obedience, Conformation, and Agility. Her first book, Chester Gigolo: Diary of a Dog Star, received rave reviews. Now she shares tips and advice on dog training, all humorously told from a dog’s perspective. In this book you will learn how you and your dog can become partners. Christina, a federally-certified court interpreter, and her husband Taylor, a commercial airline pilot, currently live in the New York City area. They share their lives with their four dogs: Morgan, Hudson, Chester, and Pepe. Winner of the 2016 National Indie Excellence Award for Animals & Pets. Winner of the 2016 Dog Writers Association Captain Haggerty Award for Best Training Book or Article.